Messe: Could iDJ2 iPod Mixer Please Even Those Sick of iPods? If you’re like me, your head is about to explode from iPod overload. 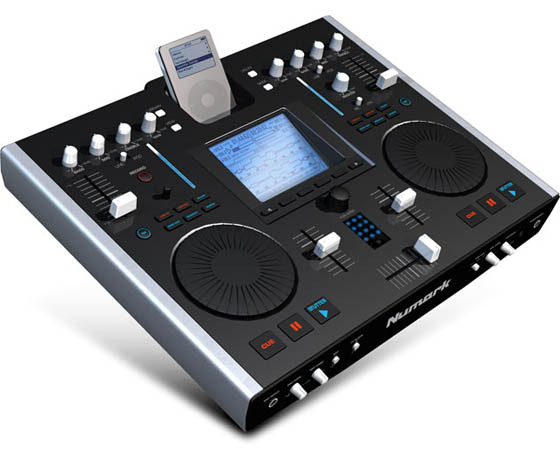 Can you still find something about a new iPod DJ mixer to love? Maybe: this one lets you connect other players and USB storage and scratch, change pitch, and loop. It might even appeal as a portable scratcher/sampler. And you can use it to play FLAC and OGG files, meaning you could dock it in your living room to play back all that glitchy, indie music you’ve been buying in the seldom-trod corners of online music stores. (Read: not the iTunes Music Store.) In fact, you don’t really even need an iPod. Here’s a first look at Numark’s second take on the iDJ — and some details on why we might just have to give it a second chance. So, I’m sure some of you rolled your eyes when you heard about Numark’s iDJ2. But wait a second here . . . now you can scratch? And you only need one iPod, since you can play two songs off of it at once? And Numark added not only pitch control but loop cross-fading? And you can use any USB hard drive (including players like my iRiver H320) or even a MemoryStick? All these new features are possible because the iDJ2 treats these devices as USB mass storage, rather than taking simple audio output from the built-in playback on the iPod. That’s a huge step forward from the iDJ, which was basically a glorified iPod dock with a cheap mixer thrown in. Numark even earned a little street cred by adding FLAC and OGG support, two high-quality compressed formats now available from some indie online labels and music stores. I’ve been listening to the Autechre reissues in FLAC from Bleep, and I have to say, this format sounds really great. In fact, looking at the specs of Numark’s iDJ2, it’s almost as though . . . get ready for this . . . they listened to feedback from their customers and product reviews. That alone should warrant giving this a second shot. Yes, I’m sure this will still be offensive to real turntablists, and more power to you. 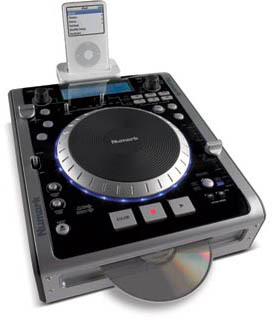 But as an upgrade for the CD-based DJ, it does look promising. The iDJ2 wasn’t the only iPod product Numark unveiled at Messe. The iCDX is a strange combination of a CD scratch unit with an iPod device. Like the iDJ2, it treats the iPod (or other hard drive) as a USB storage device. This one has a real scratch wheel, and connects via USB; Numark tantalizingly notes that it works as a standard Human Interface Device, meaning some of our more experimental and adventurous readers can do crazy things like connect the iCDX to Max/MSP or Pd. And while the iDJ2 has only large plastic discs for simulating scratching, the iCDX appears to have a more serious scratch ring. What’s your take? Is it possible Numark devised an iPod product we might actually want?